Successfully Added 3D Skull LED Light - 7 Colors, 2 Lighting Modes, 5 Watt, Power Through Micro USB Or AA Batteries to your Shopping Cart. 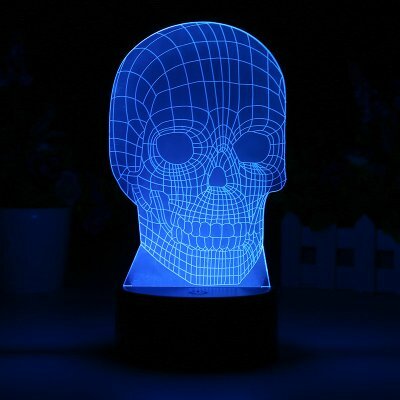 This Skull LED color light is the perfect accessory for in any boy’s room. For sale now at Chinavasion, this LED light displays a beautiful 3D light effect. Allowing you to switch in between 2 light modes and 7 different colors, this LED light is guaranteed to meet the likings of everybody out there. Thanks to its unique design, this 3D LED light is a great electronic gadget and decoration piece for in your child’s bedroom or gaming room. Emitting a smooth and colorful light, this LED color light is sure to set the right atmosphere for any occasion. With its simple single button design, this LED decoration light allows you to easily switch in between its two lighting modes and 7 different colors. Simply select the color of your liking, and you’ll be able to enjoy stunning visuals and a smooth light in your favorite color at any time of the day. By supporting two lighting modes, you will be able to either enjoy the 3D skull effect in one color or, additionally, use its automatic color change mode in which it smoothly changes between the seven different colors this cool 3D LED light has to offer. This skull light has been crafted out of durable and environmental-friendly acrylic material – making it safe to use for people of any age. Coming both with regular AA battery slots as well as a micro USB port, this LED color light offers an abundance of charging options. By supporting 5 Watt of power, this decorative skull light emits a smooth, dimmed, and colorful light through which it creates a calm environment in your favorite color along with a stunning visual effect. Simply slide in your AA batteries or connect it via its USB port and you’ll be all set to enjoy the relaxing light emitted by this beautiful 3D light. Thanks to its stunning visuals, this skull decoration is the perfect gift for any young boy out there and is guaranteed to spice up the interior of their computer room or bedroom. Arabic: - الصمام الخفيفة - Chinese Simplified: - LED 灯 - Czech: - LED světlo - Danish: - LED lys - Dutch: - LED licht - French: - Lumière LED - German: - LED-Licht - Hebrew: - נורית LED - Hindi: - एलईडी प्रकाश - Italian: - Luce LED - Japanese: - LED ライト - Korean: - LED 빛 - Malay: - Lampu LED - Norwegian Bokmål: - LED-lys - Romanian: - Lumina LED-uri - Russian: - Светодиодные - Spanish: - Luz de LED - Thai: - หลอดไฟ LED - Turkish: - LED ışık - Vietnamese: - LED ánh sáng.